There are currently more than 220,000 people in Ireland who are blind or vision impaired. 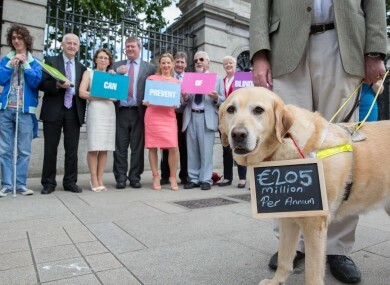 Orva the dog with Senator Conway living with sight loss asks the Government to implement a long-awaited strategy to eradicate preventable blindness. A MOTION TO eliminate avoidable blindness by 2020 and implement a coherent national vision strategy was passed today by the Seanad. Senator Martin Conway, who lives with sight loss having just 16% vision, put forward the motion calling on the new Minister of Health, Leo Varadkar to implement cost-effective measures put forward by the National Vision Coalition to prevent avoidable blindness in Ireland. There are currently more than 220,000 people in Ireland who are blind or vision impaired, with this number expected to increase to almost 272,000 by 2020. Unfortunately, my sight loss was not preventable, yet the fact that 75-80% of blindness can be avoided here in Ireland is a huge motivator for me to ensure we do everything we can to eliminate preventable blindness as soon as possible. I have 16% vision and can’t do some of the activities my colleagues take for granted, such as driving, but I have not let my sight loss hold me back. He called on his colleagues to vote in favour of the motion and to “not turn a blind eye to the economic and human impact of this important health issue”. He said that blindness and vision impairment cost the Irish state €205 million in 2010, yet up to €76 million could potentially be saved if a series of cost-effective measures for the four main eye diseases in Ireland – cataract, diabetic retinopathy, glaucoma and wet-age related macular degeneration (wet AMD) – were implemented. “This potential saving is particularly relevant since the cost of blindness is expected to increase to €2.5 billion by 2020,” said Conway. Des Kenny, Chief Executive Officer, NCBI and joint Chairperson of the National Vision Coalition said he hoped Minister Varadkar will prioritise services for those living with sight loss. He called on him to take their recommendations on board for a national strategy for vision health “to avoid further preventable blindness in Ireland,” he said. Email “Calls for measures to be introduced to eliminate avoidable blindness by 2020”. Feedback on “Calls for measures to be introduced to eliminate avoidable blindness by 2020”.